Paradise Group has opened yet another new concept under its restaurant chains in November 2014 at the newly opened One KM Mall. 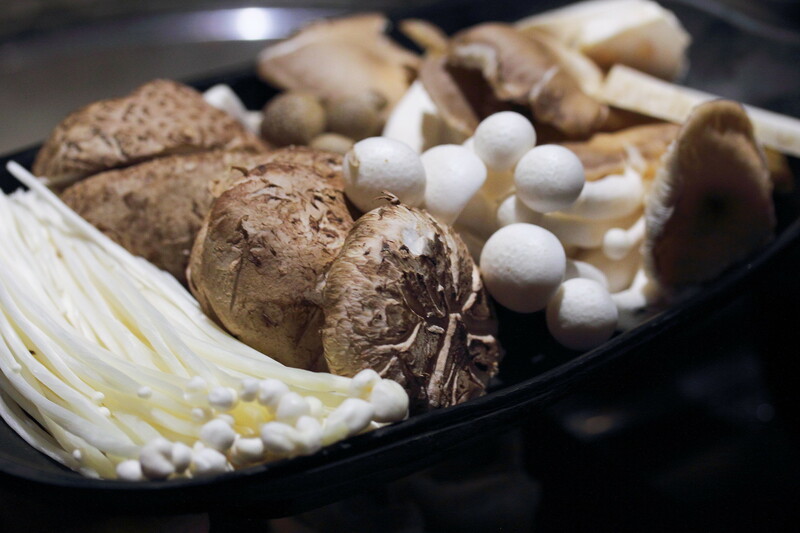 It is a steamboat concept called Beauty in The Pot, a whole new health and beauty pot dining experience that offers delectable nourishing soup bases with a wide selection of fresh ingredients for hotpot aficionados. 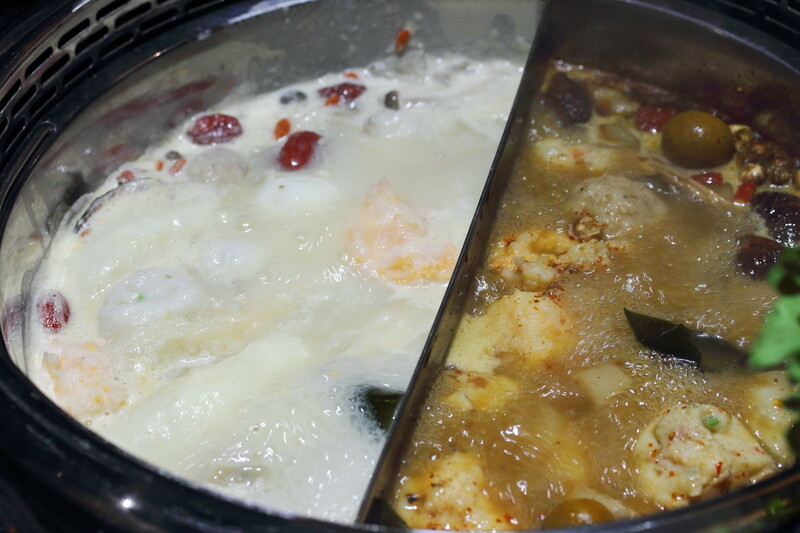 Unlike other steamboat restaurants that offers a variety of soup bases, Beauty in The Pot only concentrates on two soup bases, the Beauty Collagen Broth (Shark's Cartilage Soup) and Spicy Nourishing Broth (Pork Bone Soup). 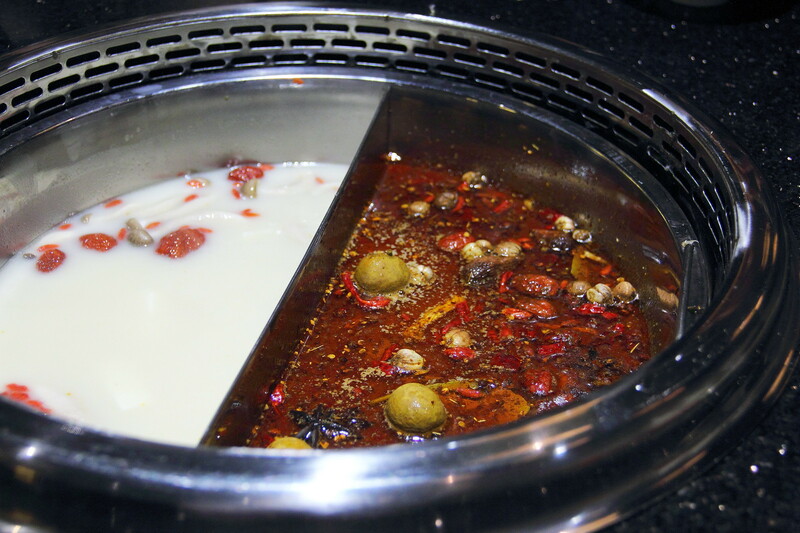 To get the best of both world, we went for the Twin Flavours Broth ($25) which comes in a yin yang pot with the beauty collagen and spicy nourishing broth on each side. From the meat menu, we tried a couple of their selections such as the US Kurobuta Pork ($9/$18) and US Wagyu Ribeye ($21/42). 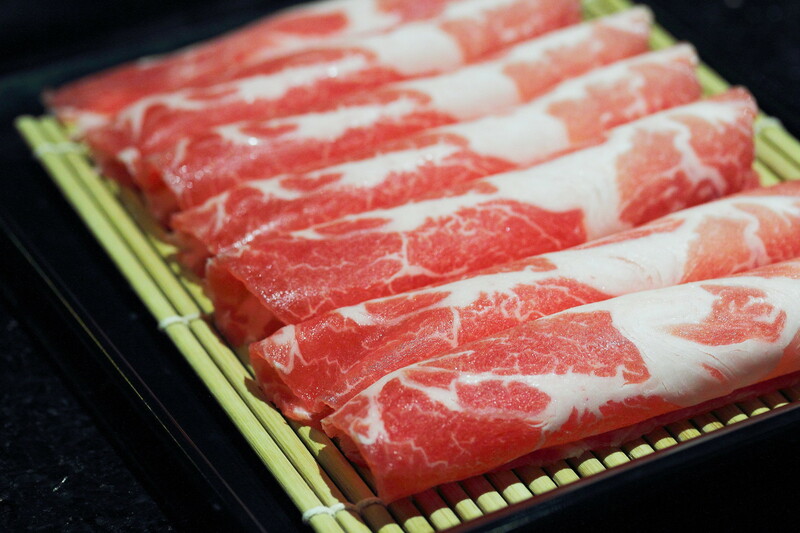 They are really good premium meat that is not too thinly sliced. 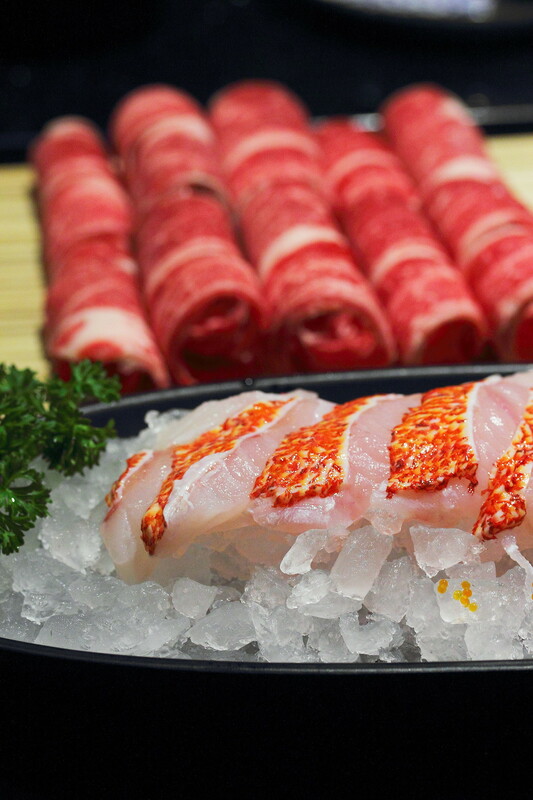 Same goes to the fresh Red Garoupa ($28/$38/$48). I dislike steamboat places that purposely sliced the meat or fish thinly, which missed out on the whole textural satisfaction. Thumbs up to Beauty in The Pot. 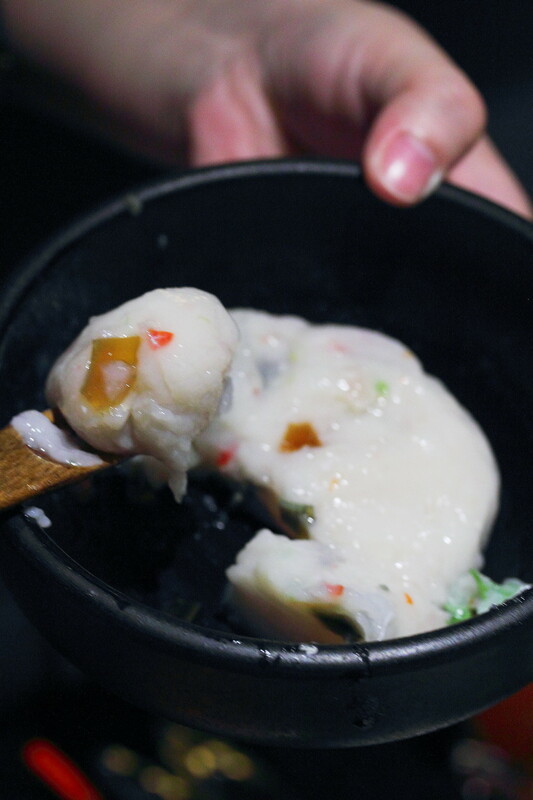 A must try at Beauty in The Pot is the Homemade Fish Tofu ($1.80/pc). 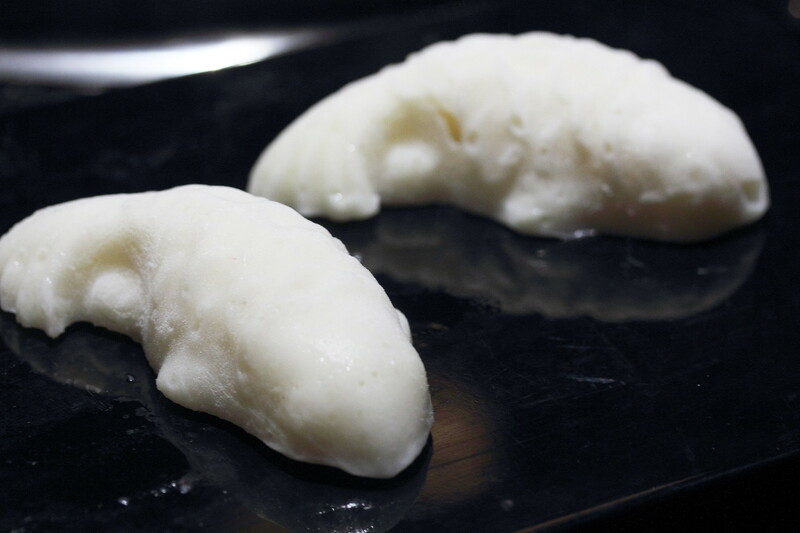 It is made of yellowtail fish paste, egg white and soy bean and shaped into a fish. It has an interesting texture that is new to me. 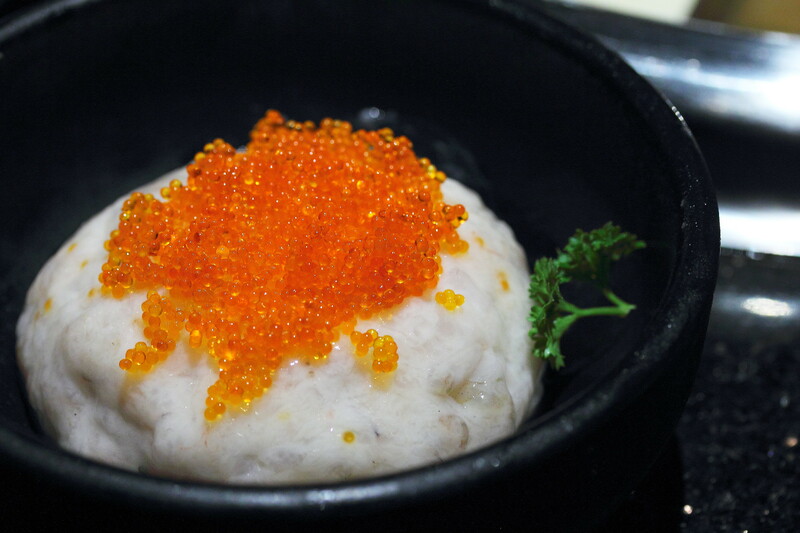 In conjunction with the Chinese New Year, this will symbolizes prosperity (年年有余), perfect to be served over the dinner. 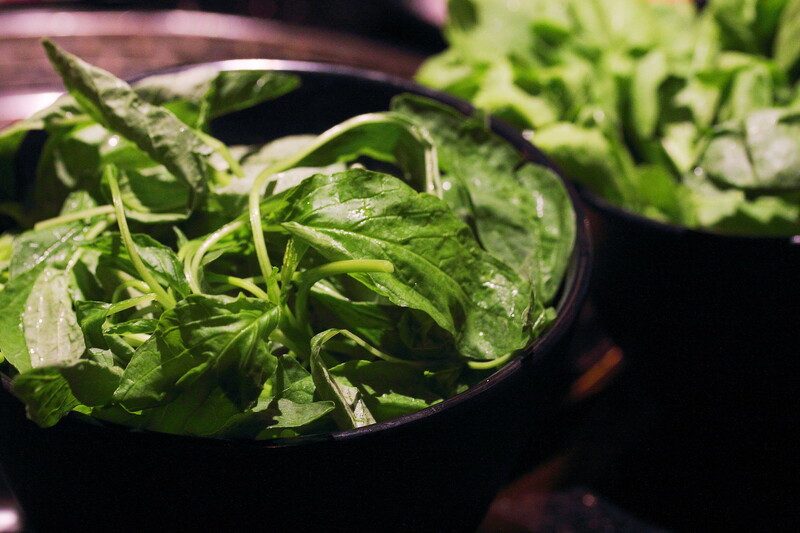 Fresh vegetables and mushrooms are also available on the menu. To simply things, we ordered he Assorted Mushroom Platter ($12) as well as the Baby Chinese Spinach ($2.50/$5) and Tang O ($3/$6) to go with the meat for a more balanced diet. 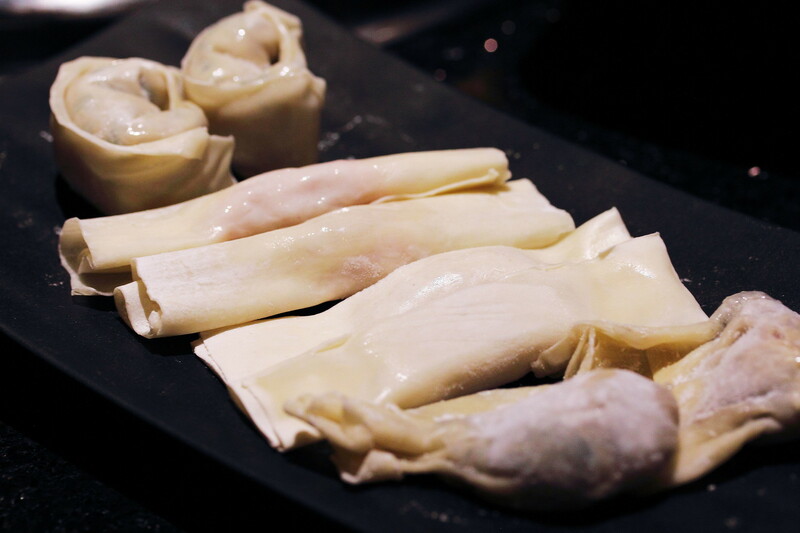 The different variety of dumplings should not be missed too. 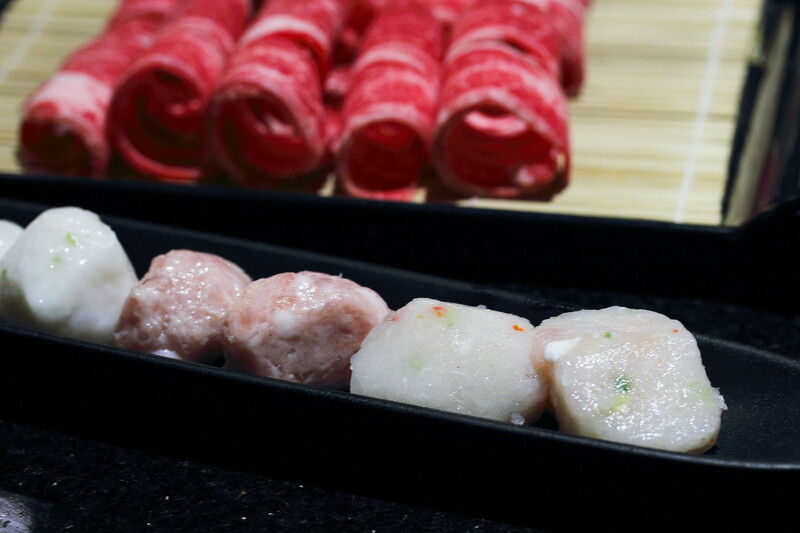 To sample everything, go for the Assorted Dumpling Platter ($10) that comes with the Pork Roll, Pork and Chives, Prawn Roll and Prawn Dumpling, two of each kind. Not to be missed is also the handmade balls. The Assorted Balls Platter ($10) will allows you to try a bit of everything. 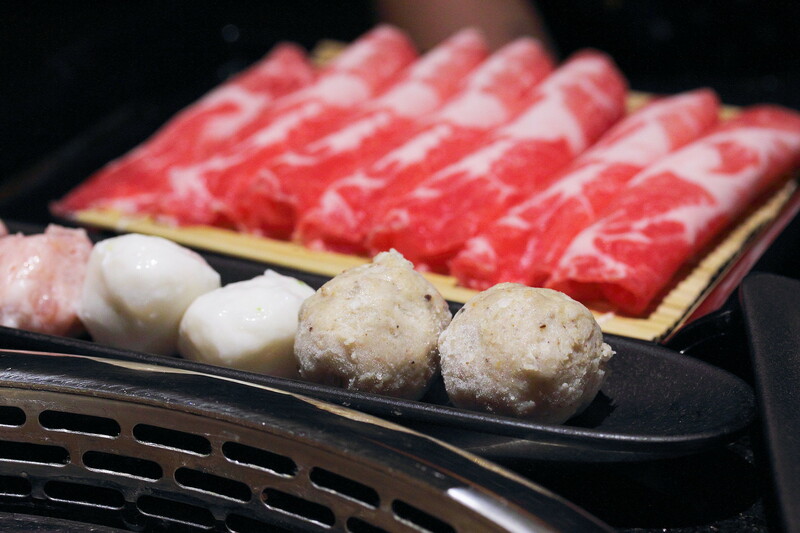 The platter comes with springy and bouncy Soft Bone Pork Meat Ball, Fish Ball, Beef Ball, Mushroom Ball and Cuttlefish Ball. Another specialty at Beauty in The Pot is the homemade paste. There are different types of paste available on the menu. We tried the Ebiko Prawn Paste ($12) and Century Egg Fish Paste ($10). Served in a bowl, we are supposed to give the paste a good mix and then roll it up into a ball shape before dropping it into the soup. The extra ingredients and the interactive presentation of paste made it even more enjoyable. Overall Beauty in The Pot has impressed me not only with the quality of the food but their services too. I have always told my friends that my favourite steamboat place is Imperial Treasure Steamboat but now I would also recommend them Beauty in The Pot. Good news also to supper seeker, the restaurant is opened till late at 1am or 3am depends on the day of the week. Eh, the tel number short of 1 number! Is there any time limitation or we can eat all we want? It is ala carte steamboat not buffet steamboat. Thanks for the inform. I called the number and confirmed it is not in service. I checked their website, unfortunately they have not updated it.